5 Questions For… Felicia Hill Briggs, Ph.D.
Felicia Hill-Briggs. Ph.D., is a professor of medicine in the division of General Internal Medicine at the Johns Hopkins University School of Medicine. She also is a core faculty member of the Welch Center for Prevention, Epidemiology, and Clinical Research. Dr. Hill-Briggs studies chronic disease self-management, behavioral intervention trials, health disparities, neuropsychology and functional impairment and disability. Q: WHY IS DIABETES CALLED A DISEASE OF SELF-MANAGEMENT? What makes diabetes unique is that the vast majority of the care is in the hands of the patient. Research has shown that the typical patient spends, on average, just one hour or so per year in the doctor’s office for the care of their diabetes. That means there are about 8,000 hours during which patients manage their diabetes themselves. They make decisions daily about how to adjust their medications, what actions to take in response to testing their blood sugar levels, what they will eat and whether they will exercise. Without effective patient self-management, diabetes goals can’t be achieved. Diabetes care, like many conditions, began with an idea of patient compliance, with instructions given by their physician, with little or no further formal patient education or support. This transitioned to recognizing a need for patients and families to have formal education and training about the disease process and their treatments to enable and empower them to adhere to self-care. Diabetes self-management education (DSME) became a clinical practice standard. Over time, research showed that knowledge is indeed necessary, but not sufficient for optimal and continuous self-management. Recommended approaches, therefore, have evolved to include behavior change, managing barriers, and decision-making in the context of ever-changing daily life experiences and challenges. Also, acquiring the skills for self-management is no longer viewed as a one-time process. Self-management education and support are needed throughout all stages of living with diabetes. Q: IS SELF-MANAGEMENT THE SAME FOR THOSE WITH TYPE 1 OR TYPE 2 DIABETES? A: Type 1 and type 2 diabetes have different causes. There are differences in the pharmacologic approaches to the two diseases. However, despite differences in specifics of medication approaches, the core behaviors needed for effective diabetes self-management are the same for people with type 1 and with type 2 diabetes: taking medications as prescribed; eating healthy; getting physical activity; self-monitoring blood sugar; managing acute risks such as hyperglycemic and hypoglycemic episodes; healthy coping; and problem solving. 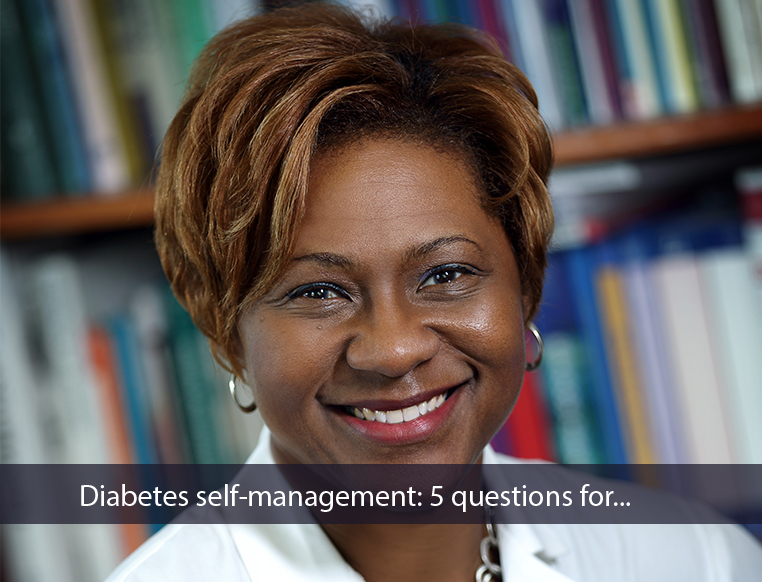 Q: WHAT HAVE YOU FOUND TO BE THE MOST CHALLENGING ASPECT OF DIABETES SELF-MANAGEMENT? A: Of course every individual is different, and people’s life contexts are different, so what aspects are most challenging for one person may not be the same for someone else. But, when we look at the primary diabetes regimen behaviors at a population level, we find that overall, rates of adherence to medications are higher than rates of adherence to other diabetes self-care behaviors. Physical activity is the behavior that tends to have lowest adherence and frequency. Q: IT SEEMS THAT SO MUCH ATTENTION FOR PEOPLE WITH DIABETES IS FOCUSED ON FOOD; HOW BIG OF AN ISSUE IS THIS? A: True, healthy eating is the behavior that people tend to describe as most challenging. They’re confused, they lack confidence about making changes, and they often have difficulties maintaining healthy eating patterns over the long-term particularly with competing family, social and other life demands. Q: IS A PROBLEM SOLVING APPROACH TO DIABETES SELF-MANAGEMENT A NEW TREND, AND WHAT HAVE BEEN THE OUTCOMES COMPARED TO TRADITIONAL TECHNIQUES? A: For someone with diabetes, dealing with all of the behavior changes at the same time and doing them well becomes the daily challenge. Problem solving is actually one of the longest-standing approaches to behavior change, originating as an evidence-based, successful psychological therapy approach. What’s new is adapting it specifically for diabetes self-management training and support and developing a structured program for use. Our DECIDE program, for example, has been tested in several NIH-funded randomized trials, demonstrating improvements in patient problem-solving, knowledge, and self-care behaviors. And when it is compared to other self-management programs, our problem-solving approach results in improvements in several disease control outcomes of importance to patients and providers including A1C, blood pressure, and cholesterol. I also have preliminary evidence that our program improves eGFR in patients with chronic kidney disease. Dr. Felicia Hill-Briggs’ DECIDE program is an evidence-based patient self-management program to improve clinical outcomes in diabetes and related conditions. Using a structured, sequential, curriculum, patients are trained in problem solving as a skill to enable them to perform all other diabetes self-care behaviors.